Ivan: i sent you that “vox humana” audio, as an example of a band (i.e. mine) who don’t perform ‘live’ and probably never will. but we roll out albums pretty consistently. but we don’t get on the radar screen of those music review sites i told you about. Ridzwan: ah i see. but why do you do it? Ivan: it’s like what you heard/ saw in the video at CC SG day. music is a passion. Got no reason one. Ridzuan: so it’s the creation process that you enjoy? Ivan: exactly. plus the collaboration. you add process and collaboration, you have learning. 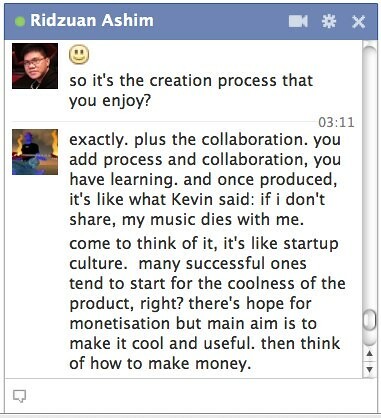 and once produced, it’s like what Kevin said [at CC SG Day meetup]: if i don’t share, my music dies with me. Ivan: come to think of it, it’s like startup culture. many successful ones tend to start for the coolness of the product, right? there’s hope for monetisation but main aim is to make it cool and useful. then think of how to make money. Ivan: i guess same approach with my band. we make music that we find it nice and therapeutic for ourselves. then if something more can happen, that’s a bonus. Ivan: that way, we can only be delighted rather than disappointed LOL. Damn, i wish i was blogging all this down.